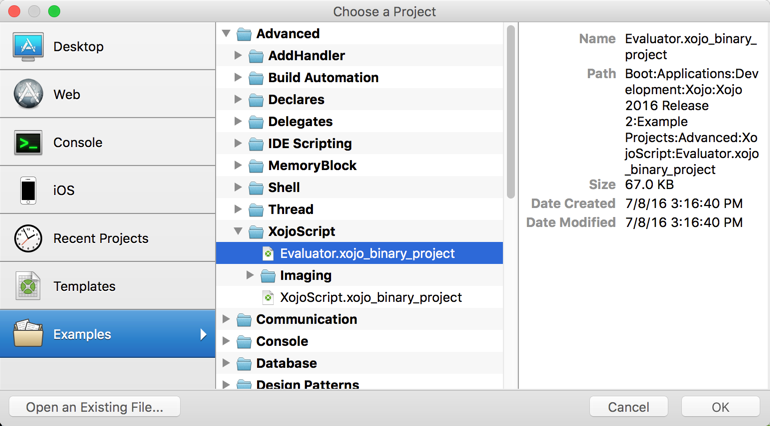 First, you can find the example by opening the Project Chooser (File->New), clicking “Examples” and then going to Advanced, XojoScript and selecting Evaluator. Looking at the project you’ll see it has a primary Window (MainWindow) and a class called Evaluator. 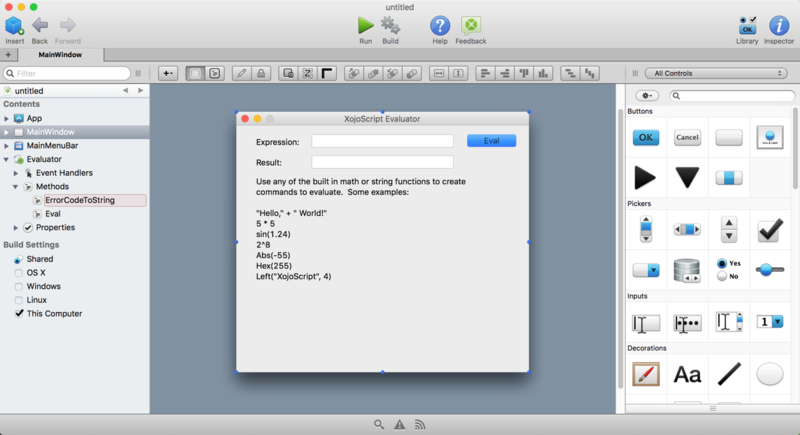 The Evaluator class is a subclass of XojoScript. The way this project works is that it takes the formula that was entered in the TextField of the window and embeds it into XojoScript source and then runs the source to get the result, which is returned back to the window to display. This code assigns the XojoScript source using the Source property and sets the Context property to itself which allows the XojoScript source to access the mResult property on the Evaluator class. Then it runs the XojoScript source. This source assigns the formula to the line “Dim expr As Variant”, checks if the result is numeric and if it is, converts it to a string. The expression is then assigned to the mResult property so that it can be accessed outside the XojoScript source. Which, back in the code for Eval, is what gets returned to the caller to display. 54 + “test” displays a “Type Mismatch” error. “Dim i As Integer” displays a “Syntax does not make sense” error. This sort of technique can be useful for projects where you want to dynamically run calculations that are not determined until the app is run. You\’ve just created an App with local code execution vulnerability without warning beginners about the lack of security of your example. XojoScript code is sandboxed. What risk/vulnerability with this simple example concerns you? What concerns me is not necessarily technical. This is just the lack of warning that bothers me.